O.K. what do you get when you combine the fact that lots of weird things happen in Florida, and lots of weird things happen in church? Well, how about lots of weird things happen in church in Florida, take for example the communion bandit of Jensen Beach Florida. So what happened was a 33 year old man, in a Catholic church decided to make away with a bunch of hosts. No, not that kind of hosts, he wasn't kidnapping little old ladies. He was nabbed and pinned to the floor until the police could come by an 82 year old and a 61 year old man. Nothing makes a faithful old Catholic madder than someone trying to steal the body of Christ!!! Suddenly these two men didn't need their Geritol that morning--- the adrenaline rush was quite enough. The most amazing thing is that this 33 year old man thought he could get away with this caper DURING A WORSHIP SERVICE! What was he thinking? Was he thinking-- "Well the hosts are tiny, no one will miss them?" Was he thinking---"They've got so many of them, they can spare some?" Was he thinking---"No one will mind, they taste like cardboard anyway?" Was he thinking-- "The priest is nearsighted, he won't notice how many I grabbed?" Anyway, he's being held in the Martin County jail on the charge of disrupting a religious assembly, among other things. This gave me an idea. I didn't know you could be thrown in the pokey for that. Hmmm, you know this could be a way of getting rid of disruptive church members. You know the one's I mean. This law could be applied rather easily in a Pentecostal Church where people are constantly standing up and exercising their charismatic gifts even when the pastor says "let everyone be silent and I will pray." I wish I had known about this law a long time ago. I remember one Sunday whilst working in Hamilton UMC in Massachusetts a phone call came in. It was the Catholic priest from the neighboring church. There seems to have been a wedding there on the day before and someone left a whole host of hosts just sitting on the altar after a wedding of a Catholic and Methodist couple. He wanted to know if they had been consecrated or not. I did not know, since no one at my church had participated in the service. I could hear an audible groan at the other end of the phone line, and then the priest said "so I have to eat all these Eucharistic wafers before the next service. Arrgh. I need some wine to wash them down." And he hung up. My advice to the communion bandit is-- Next time you try a trick like that, have enough sense to go to a church which doesn't believe the wafers are actually the body and blood of Jesus. You'll never get away with stealing that sort of stuff! White little pieces of stuff that taste like cardboard and are not believed to morph into Jesus' body--- well maybe other parishioners will even encourage you to take and eat them for others! And Dat's all I gotta say 'bout dat. 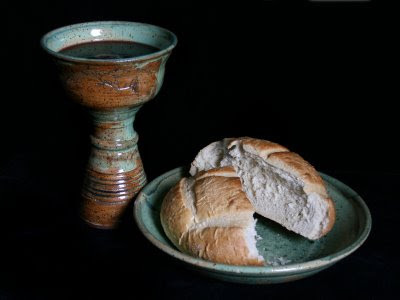 If you are actually interested in the meaning of the Lord's Supper, check out my book Making a Meal of It. Considering the recent movement by fundamentalist atheists to break into Catholic churches and steal the hosts in order to make videos desecrating them on YouTube, then I can see why they might be a little defensive. Maybe he was thinking if David and his companions can do it, why can't I? Is it weird that this story kind of makes my day happier? Whoa, ranger. I never heard about that. That is absolutely terrible. When I shared this on FriendFeed, I received an interesting response from someone who felt that this was an "[i]nteresting story until the end when the author just had to go anti-Catholic....The author could have made his point without taking gratuitous shots at one of the core beliefs of Catholicism." I assume you didn't intend to take a gratuitous shot, and I myself missed the fact that some could consider this offensive. Just wanted to alert you. Well, I don't know how true this is, but once upon a time, I was told that Satanists would steal hosts for their ceremonies thinking that they were actually abusing the body of Christ. I'm not into transubstantiation, so I say they were just stealing bread, but it's still wrong, of course. At the height of anti-semitism in Europe in the Middle Ages, one of the favorite trumped up charges used to justify the abuse of Jews was accusing them of stealing the hosts.